Roaring Brook Press, 9781596438903, 40pp. The crew of the pirate ship the Rusty Heap are a fearsome bunch! They're tougher than gristle and barnacle grit. They heave and they ho and they swab and they . . . knit? Well, one of them does, at least! Unfortunately for Ned, his knitting doesn't go over well with the captain and crew. They urge him to hide his hobby and strive to be scurvier, like pirates should be. But when the briny ocean beast shows up to feast on the Rusty Heap and its crew, maybe Ned's knitting is just the ticket to save the day! 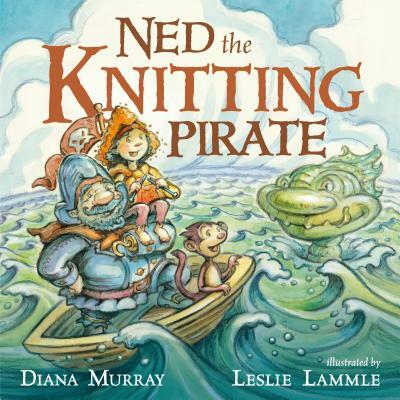 From author Diana Murray and illustrator Leslie Lammle comes the delightfully salty tale of Ned the Knitting Pirate, a boy whose love for yarn and appliqué just doesn't quite let him fit in, but makes him stand out in the best way, instead. With their appealing angle on individuality, Murray's hilarious characters and Lammle's bright illustrations are sure to win over even the most reluctant landlubber. Diana Murray grew up in New York City and still lives nearby with her husband, two daughters, and a spiky bearded dragon who loves listening to stories—especially about dinosaurs. Some of Diana’s other picture books include Grimelda: The Very Messy Witch, Ned the Knitting Pirate, and City Shapes. Her poems have appeared in magazines including Highlights, High Five, and Spider.